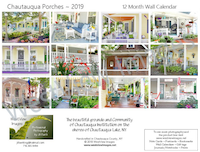 This 12-month wall calendar by WestView Images showcases Chautauqua Institution porches photographed by Jill Santi. 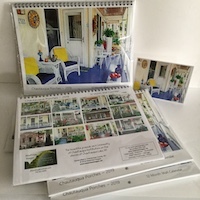 The calendar also includes a matching note card inside. features: spiral binding, semi-gloss images, matte month pages for clean writing space. Includes traditional holidays, moon phases, and previous and next month reference calendars.